Although the New Jersey governor tackled Hurricane Sandy recovery head on, he has refused to similarly address the climate change that will make these storms more common. Last week, as news circulated of New Jersey Governor Chris Christie’s weight-loss surgery, so did a video in which Christie parodied his own brand—and the fleece he wore day and night during the Hurricane Sandy crisis. In the video, he asks everybody from Morning Joe to Jon Bon Jovi if they’ve seen his now-missing fleece, without which he is powerless, like Iron Man without his suit. The governor may be able to poke fun at the absurdity of, among other things, his rising star, rumored ambitions and “relentless” fleece, but his real shortcomings are no laughing matter. It was, after all, while wearing that infamous fleece that he raced across his state, doling out no-nonsense quips about recovering from the storm. 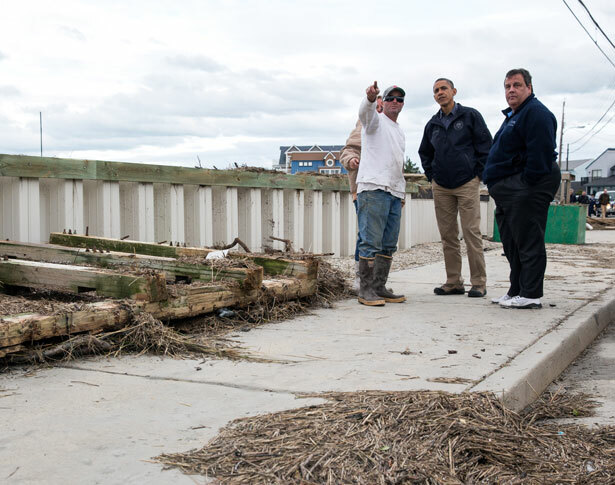 And who can forget the iconic images of Christie and President Obama surveying the wreckage together, finding love, it seemed, in a hopeless place?